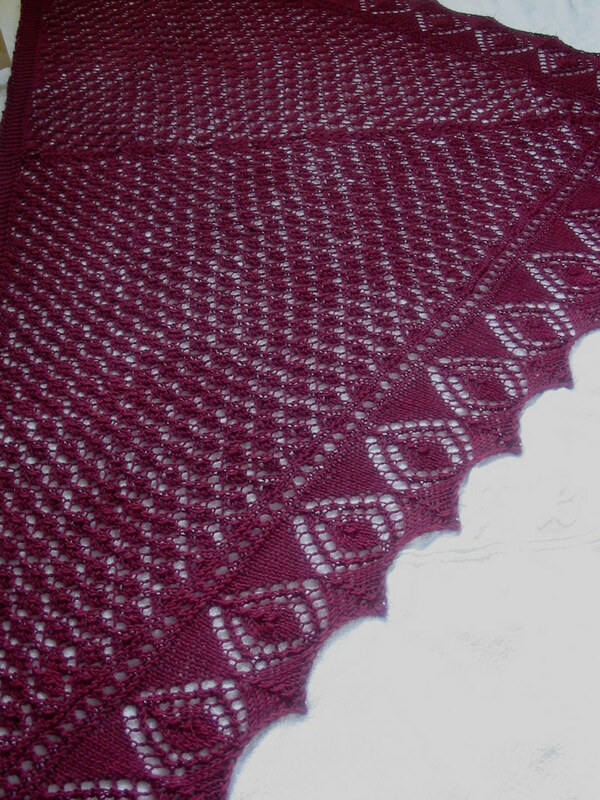 A Bluestocking Knits: Thoughts on "Ene's Scarf"
Finished "Ene's Scarf" yesterday morning. 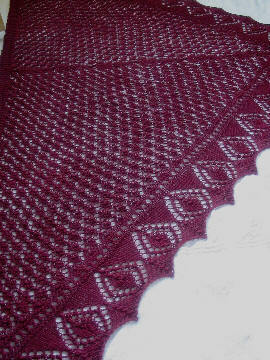 All things considered, it is a fairly easy knit, for lace. The main pattern is easy to memorize, thus I found myself daydreaming and adding a yo where I wasn't supposed to, but the mistakes are easy to catch (the pattern will be obviously out of sync at the exact point of the mistake) and easy to fix. It's a little difficult to visualize how the scarf will come together at first, but when you understand that the garter stitch "edging" is actually the top edge of the shawl (the hypotenuse, if you will), it becomes clear. The Merinogold is very pleasant to work with, very soft and springy. It splits occasionally, but not enough to be annoying -- it doesn't splice very well, but I was just working with Silk Garden, which makes a really sturdy, practically invisible join (the clingy mohair or the silk? ), so the merino had a hard act to follow. It does have a strange mothbally smell when wet, but that shouldn't be a problem once it is dry. I like the cast-on, the knitted method (as opposed to the usual cable cast-on) used with yarn doubled. This cast-on usually looks a bit limp, but with the doubled yarn it has an interesting almost braided twist look. I wasn't terribly impressed with the sl 1 knitwise, K2 tog, psso combination -- my psso stitches always look a bit straggly -- and would recommend trying sl next 3 knitwise, K3 tog tbl as a possible alternative. I would also recommend swatching on the lace pattern instead of st st, as I tend to knit a lot looser in lace (why did I forget this? ), and my scarf came out a bit bigger than the original. One of the most fun things about this pattern is that even though it starts off with a rather appalling 375 sts, the decreases come thick and fast, so by the time of the second repeat of Chart 3, it felt like I was really sailing along. It was amazing, how much quicker the chart repeats became! that scarf came out beautifully! 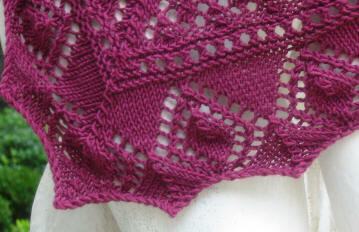 i'm recently on a lace kick, so i will definitely need to pull out my old IK copy and check out the pattern some more. and that's a great point about it going faster since it started out big and decreased to the point -- so many lace shawls and scarfs i see just depress me when i look at the pattern since you start with 3 stitches and then build to these giant giant numbers... ! it's all about fooling the mind, isn't it? Wow, this is gorgeous! I've been debating knitting this for a while, but never having knit lace before, I've been hesitant...I think you sent me over the edge. What yarn did you use, it's fabulous?! 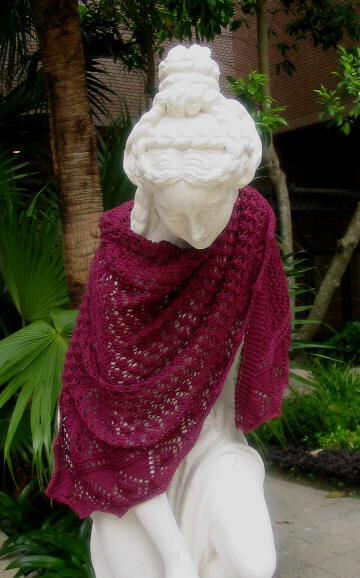 Gorgeous scarf/shawl! I have yarn for it (actually bought two different ones) but must finish many other projects before I can begin. Thanks for the inspiration. She is absolutely beautiful! Gorgeous color too! Very, very pretty. I want to make this one, too. I know what you mean about the straggly PSSOs. I'd suggest a slight change on your alternative: s1 knitwise, s2 tog knitwise, then knit all 3 together to the back loop. That puts the stitches in the same order as the original decrease. Thanks for the lace tips - I'll remember that and Naphele's above for PSSO's. Lovely scarf, and what a beautiful color! Very nice. And here's yet another double-decrease suggestion: slip two together knitwise, K1, pass the two slipped sts over the k st. This makes a centered double decrease, with the middle stitch lying on top of the stitches on either side of it. It makes a nice straight line in a pattern like this. I too love the yarn you used for this scarf! What is it exactely? Which "yarn-maker", I mean, since you mentioned in your post that the quality is "Merinogold". Thanks, and congrats, it's simply gorgeous! 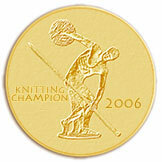 "Merinogold" is the name of the yarn, and the maker is Grignasco. I had never heard of it before I found this at a yarn shop here in Hong Kong, but it is apparently quite popular here. So far -- I've not actually washed it yet, only blocked it -- it seems to be comparable to the Anny Blatt merino. The way I sometimes keep track of things with these more-complicated lace patterns is with a large safety pin, but you can use stitch markers with Ene, as the position will stay the same on each row. You should have 313 stitches after finishing Chart 2. Work the 8 sts of the border in Chart 3 (reading from right to left), then the 13 sts of the right side of the right-hand side. Place a marker after these first 13 sts. You are now ready to start the 6-st repeat. Your center st should already be marked, although of course by this point you will be able to SEE which st is the center. You can see from the chart that you will need 13 sts at the other side of the right-hand side for the first row (row 33). Count 13 sts in from the center st, (moving from left to right), and place a safety pin or split marker to the right of the 13th st. You now know where you need to stop the 6-st repeat -- you should have a number of sts divisible by 6. Work the 6-st repeat until you get to the safety pin, then you should have 13 sts left for the left edge of that side, then the center st. If you want, you can replace the safety pin with a marker. You can check your work with math. 313 sts total = 8 border sts + 148 sts left-side section + 1 center st + 148 sts right-side section + 8 border sts. 148 sts - 13 non-repeat sts on right edge - 13 non-repeat sts on left edge = 132 sts. 132 / 6 = 22, so you will do the 6-st repeat 22 times on the right side (then the same on the other, of course). Obviously, the stitch count will be decreasing by 1 on EACH side of the two big triangles -- 4 sts each row total. You will have 12 sts at each side on row 35, 11 on row 37, and so on. The point in each row at which you stop the 6-st repeats, though, is always the same, and so you can use the stitch markers to let you know where to stop and move on to the next bit. I like using a lot of markers because then if I've made a mistake, I can tell almost right away, because the pattern won't come out even when I get to the marker after the mistake! I just found your blog looking for people who knitted Ene. I have 1 1/2 hanks (76 gr to be exact) of Knit Picks Shimmer and was wondering if it will be enough. I just don't want to run out of it just before the end. It's not like you can quit on that shawl whenever you want.